I am originally from the East Coast, specifically the New England area. For me there was always something special about the beach, and beach cottages. Beach cottages were somewhere that families went in the summer to escape for a week or two, where no one got mad if you traipsed in a little beach sand and sat around the porch in a wet bathing suit. There is just something special about them. 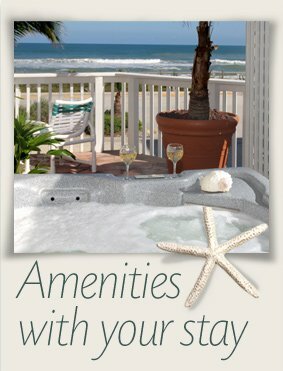 At Oceanfront Beach Cottages I love that feeling of walking into a room that is comfortable, yet charming. Where the furnishings are pleasing but not contrived. They look and feel cozy, like family members have brought their favorite pieces of furniture to their beach home. Every year for the past five years, when I come to visit my family in Florida, my sister, Valentina, books a suite for me and whoever travels with me at this really special little spot in Indialantic, Florida. It is directly across the street from a beautiful beach, and from the windows and porches of the cottages, one can watch the sun rise and sparkle on the ocean. It is peaceful, quaint and the epitome of relaxation. Each suite has a big, comfy bed, a couch and chair and a kitchen with a table. There are plenty of great restaurants nearby, but it’s nice to stock the refrigerator with chilled white wine, good cheese, some crackers and fresh grapes. As the sun sets on a another beautiful day, you can take a dip in the pool that sits in the small courtyard, then walk back to your suite, open the wine and cheese, and just watch the sun go down. Oceanfront Cottages’ wonderfully decorated outdoor areas are filled with the quaint details of a privately-owned beach cottage. You’ll find barbeques, porch swings, beach chairs, umbrellas… virtually everything you need to kick back and take in the sun and sand. Make a quick run to the corner Indialantic supermarket–which itself is a unique and rewarding side trip into the exotic world of specialty foods–for your food & drink. Now don your flip-flops and you are set for a week of mellow beachcomber-style leisure.